Turn on all the projectors on which you want to match the display quality. Set ID numbers on each projector. Set the remote control ID to match the first projector. Press the Menu button, select the Image menu, and press Enter. Set the remote control ID to match the next projector, then select Image menu adjustments as necessary to match the projectors' displays. Note: The brightness and tint may not match exactly even after adjustments. 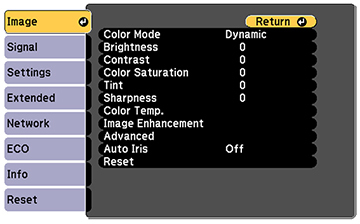 If brightness and tint differences become more noticeable over time, repeat the adjustments.